In years to come, your Eyewitness believes the meeting yesterday between President David Granger and Opposition Leader Bharrat Jagdeo will become our local equivalent of the one between Churchill, Stalin and Truman to divvy up Germany after WWII. The disagreements at that “Potsdam Conference” led directly to the Cold War, from which we’re still recovering. 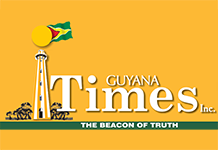 And in like manner, the disagreements between Granger and Jagdeo will colour the politics of the two blocs that compete politically and every other “ally” in Guyana, for the next four decades. ‘Cause whichever party will be in power next year – when the billions of barrels of oil start to flow into the world’s oil market and the billions of (US) dollars start to flow into (hopefully) our Treasury – will be able to ensure they remain in power for at least that long. And it’s for this reason, your Eyewitness never held out any hope of Granger going along with ANY of the conditions Jagdeo set as a prerequisite for the meeting. Right off the bat, Granger didn’t agree to announce a date for the elections AHEAD of the meeting as demanded by Jagdeo. He merely said he’d meet “to discuss the issues” the latter had raised. What’s to discuss? Jagdeo had already said the PPP was willing to vote along with the Government to cobble together the required 2/3 of the National Assembly to extend the date to April 30 – the life of the voters’ list. Once Granger hadn’t done that…it’s house-to-house registration, baby – meaning elections in 2020!! Why then, even show up?? Well, Jagdeo did say he “wasn’t optimistic” as he went into the meeting!! Jagdeo’s second demand was that no new contracts be awarded. This ain’t gonna happen, even if hell freezes over. Which, we know, is impossible with the Devil stoking his fires just as vigorously as the PNC partisans here, who’ve branded the PPP as worse than the Devil!! The PNC will just smirk, when the next batch of contracts is doled out that they’re allowed under the doctrine of “necessity”. Who’s to decide conclusively what is “necessary” in public projects, like, say, even the new Demerara Harbour Bridge? Certainly not the courts!! And the PNC faithful will be duly rewarded, since they’ll pass on their cut to the PNC campaign!! No new agreements, loans and leases?? Ditto as above!! The biggest snicker was over the demand that there’ll be “no abuse of state resources for partisan purposes/activities”! This will be even slipperier to pin down than the above!! Finally, there was the demand for the Opposition to have access to the State media!! Ha!! Over Moses’ dead body!! 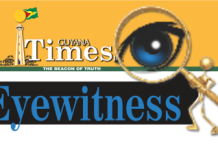 The saga of DNA testing in Guyana – to match crime scene human evidence to nab perpetrators of crime – epitomises the abject failure of Khemraj Ramjattan, and his government on crime. He’d lambasted the PPP upon assuming office in 2015 – especially his predecessor, Clement Rohee – for not equipping the Forensic Lab they’d begun constructing, with a DNA testing machine. Then he evidently fell into a black hole for the next two years and finally promised one at the end of 2017 ‘within months”. In Feb 2018, he swore the equipment would be in “by June” and technicians were being trained. Well, 2018 came and went and here he is, on the verge of being expelled into oblivion after Charrandas’s “yes, yes, yes” NCM vote, and Ramjattan suddenly remembers his promise! And says the machine will be here “soon”!! Now if you can’t even keep track of a single machine that’s crucial for your fight against crime, how can anyone believe this government – when they insist they’re “winning” that battle!! Seems we have a “Mexican Standoff”, between the bauxite union and RUSAL’s management. The PNC Government – with elections in sight – has sided with the workers. Even allowing them to ILLEGALLY block the Berbice River! !